With the flooding of the Guaíra Falls between Brazil & Paraguay in 1982, the mighty Iguazu falls currently has the greatest average annual flow of any waterfall in the world. You can view my photo slideshow of Iguazu Falls here, and my Iguazu Falls video here. The entire Iguazu waterfall system consists of 275 waterfalls along 2.7 kilometers (1.67 miles) of the Iguazu River. Some of the individual waterfalls are up to 82 meters (269 ft) in height. The Devil’s Throat (Garganta del Diablo in Spanish or Garganta do Diabo in Portuguese), a U-shaped, 82-meter-high, 150-meter-wide and 700-meter-long (490 by 2300 feet) waterfall, is the most impressive of all, and marks the border between Argentina and Brazil. 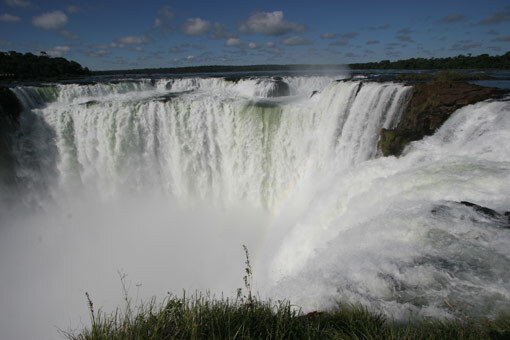 The shape of Iguazu falls, and the walkways around the falls on the Argentinian side allow for spectacular vistas. At one point a person can stand and be surrounded by 260 degrees of waterfalls. The Devil’s Throat (La Garganta del Diablo pictured below) has water pouring into it from three sides, and being up close to it gave me a peculiar kind of vertigo. Famously, upon seeing Iguazu, the United States’ First Lady Eleanor Roosevelt reportedly exclaimed “Poor Niagara!”. She was right, the water falling over Iguazu in peak flow has a surface area of about 1.3 million ft ², by comparison, Niagara has a surface area of under 600,000 ft ².